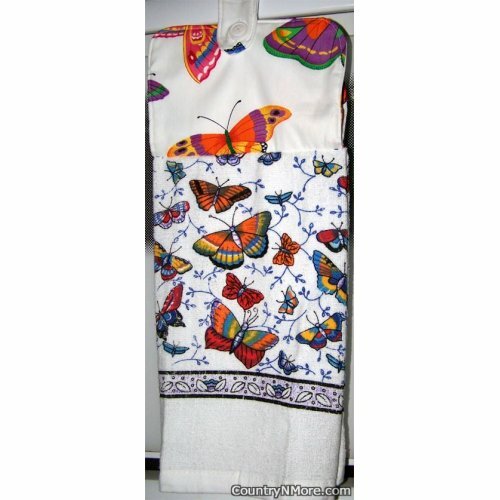 This butterfly oven door towel has gorgeous colorful butterfliesfluttering about on the towel. This oven door towel has the wings of a pink, red, yellow, blue, and white butterfly in the upper left hand corner. There the wing of a purple, yellow, green, and orange butterfly in the upper left hand corner. Last not but least, there is a gorgeous orange, purple, yellow, and green butterfly peeking out from the bottom. There areseveral oven door towels using the butterfly towel and the butterflyprint. Each one is unique and has been listed separately. We use fulltowels for all of our oven door towels and every oven door towel has abutton closure.